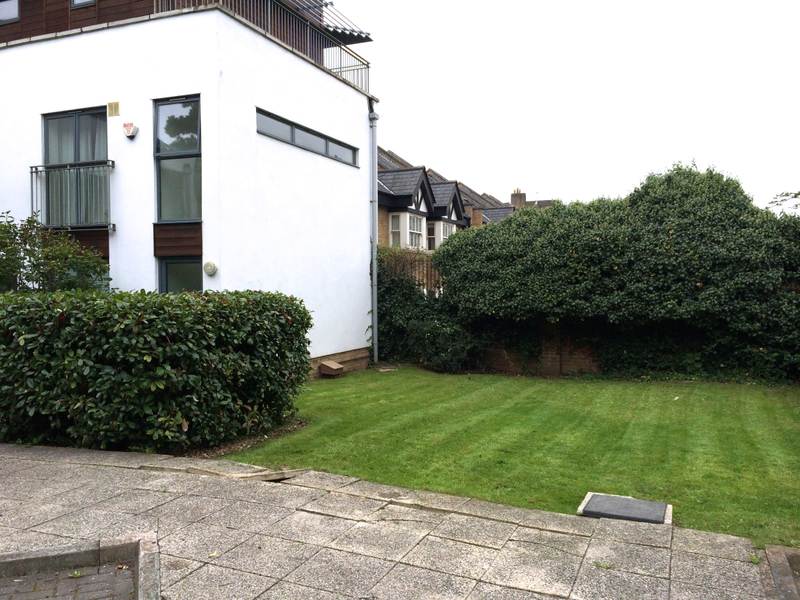 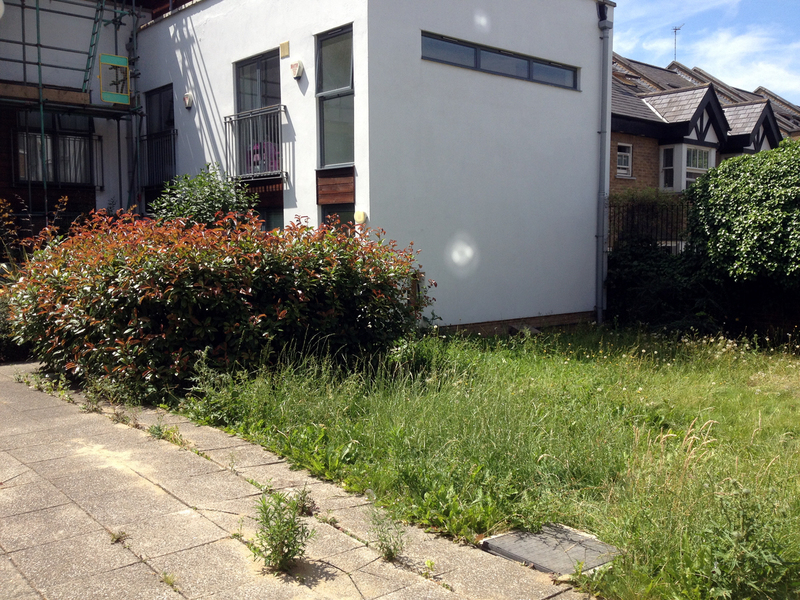 April 2014 saw us take over the garden and grounds maintenance contract for this small and secluded site off of a busy road in Streatham South London, these top three photos to the right show the condition of the site when we took this over with grass areas that could be described as a bit of a jungle and shrubs overgrown and out of shape. 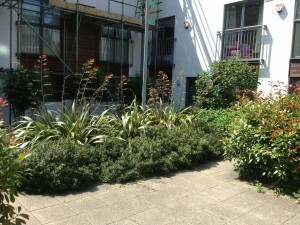 The initial contract maintenance visit was used to get the gardens back into a maintainable condition. 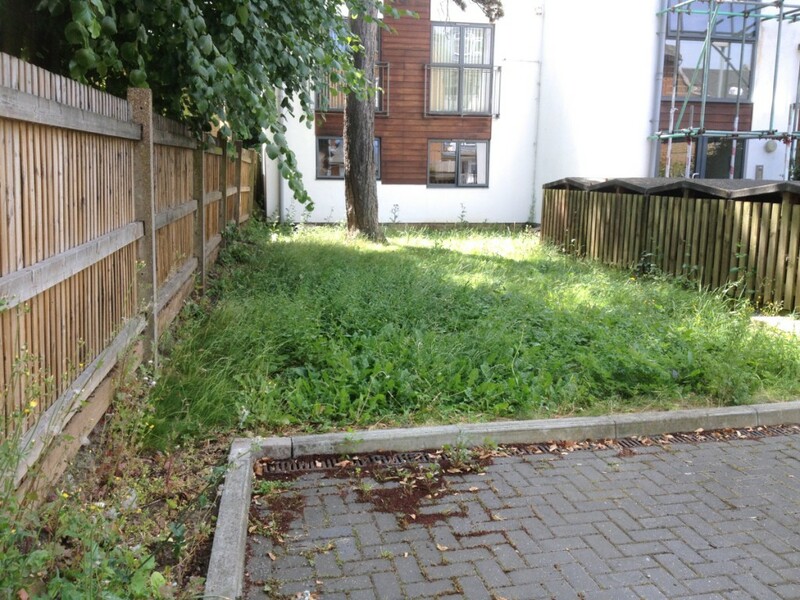 With the grass being so long we first had to strim throughout these areas and then cut with a lawn mower at least three times until all cuttings were collected and the grass was cut to the correct level. 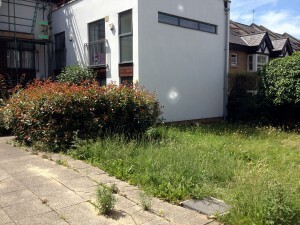 As the grass had been left unkempt for a long period weeds had taken over in great numbers therefore getting the lawns back to a good condition will take time, firstly regular grass cutting will continue to improve the actual grass and regular applications of a weed and moss control will help to eliminate the weed problem, the grass will also be fed to ensure strong growth and good colour. 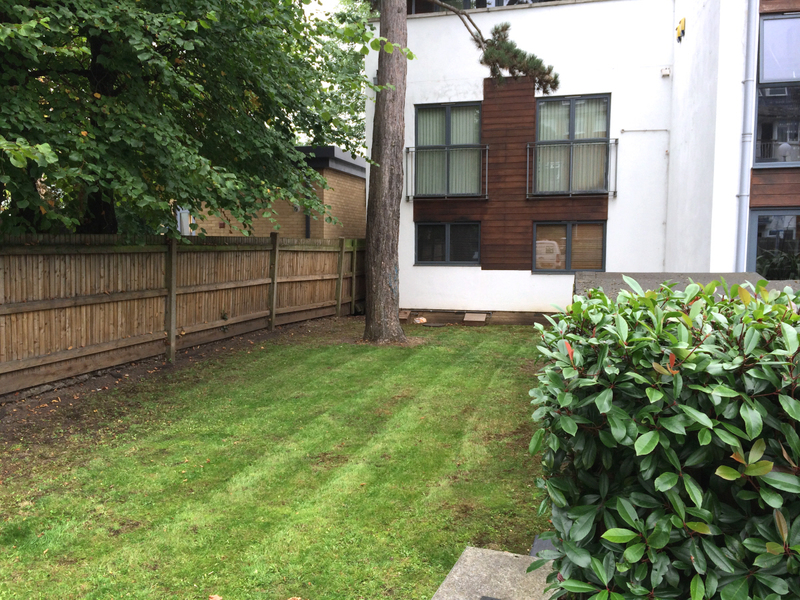 As the lawn areas improve they will be monitored and where necessary at the correct time of year will be over seeded and bare patches repaired. 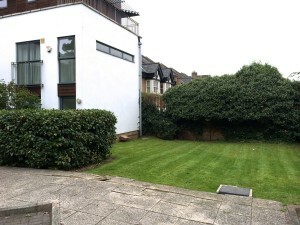 Lawns in this condition do take time to get back to how they should look, however the initial grass cuts provide an immediate improvement and with continual care and attention the grass areas will look better and better over time, as always we approach contracts as a long term commitment so long term improvements can be achieved. 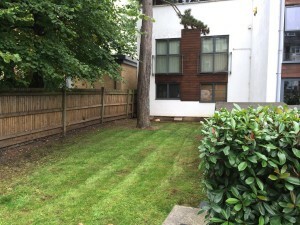 The shrubs on site were overgrown but in fairly good condition and were cut back to size and shape on the initial visit, in some areas the shrubs had grown woody and leggy but now cut back they will green up and become more bushy again and with regular trimming will continue to improve. 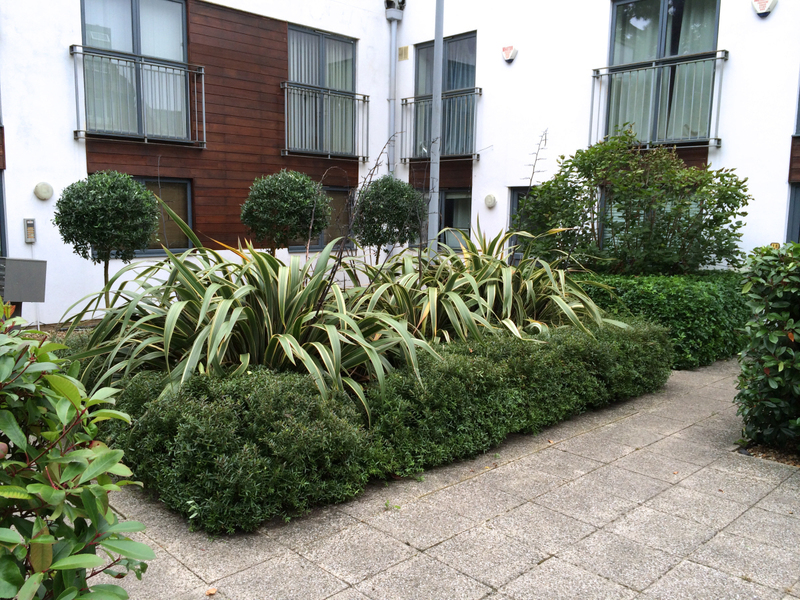 As time goes on dead wood or unhealthy growth will be identified on the shrubs and pruned out accordingly. The hard standings did have significant weed growth so we pulled out any large weeds by hand and laid down a weed control to kill off the smaller weeds, once these have died back we will remove the dead weeds and lay down a weed control regularly on subsequent visits that will keep the site weed free.